Frogs are common amphibians found in various habitats around the world. Many frogs undergo a stage of life between egg and adult known as the tadpole stage -- it's their larval stage. During this stage, frogs change both physically and behaviorally. According to Animal Planet, the metamorphosis from egg to adult can take 10 days to two years to complete, depending on the species of frog. After an average of 21 days, tadpoles hatch from their eggs. Newborn tadpoles have mouths, lidless eyes, gills and tails. After six to eight weeks after hatching, the tadpoles develop hind and front legs. The tadpoles' skin becomes thicker. After 12 weeks, the tail begins to become smaller and smaller, ultimately absorbing into the body. Not all species of frogs undergo a tadpole stage. For example, a species living on the Solomon Islands lays eggs that hatch into almost fully developed adult frogs with miniature tails, known as froglets. 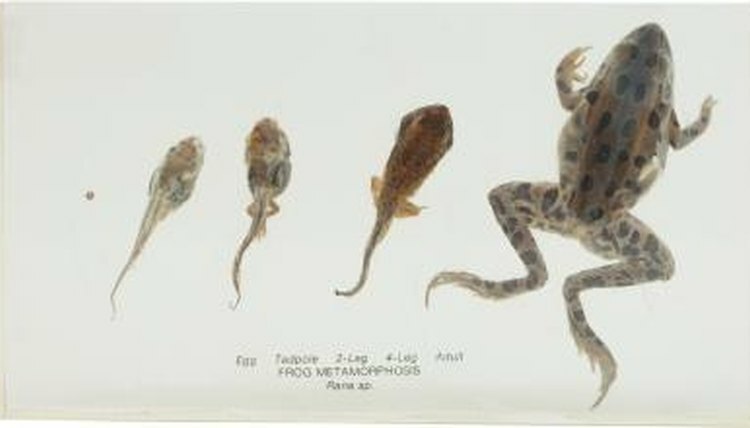 As tadpoles develop into adult frogs, they undergo several internal transformations. To be able to breathe on land, tadpoles develop lungs and nostrils to replace their gills. Tadpoles' bowels shrink in size from a long coil to a short gut, since as adults they will feed on meat like spiders and flies instead of algae and other aquatic vegetation. Additionally, tadpoles develop tongues to be able to hunt as adults. Frogs typically live in environments with access to permanent water such as ponds, slow-moving streams or wetland habitats. Certain species spend most of their lives in and around water, while other species travel to water solely to breed and lay their eggs. Some species of frogs live on trees, while other species live in rocky habitats and never enter water at all. Tadpoles live and feed in water for several weeks until they develop legs and lungs. Tadpoles consume algae and decaying organic materials that fall into the ponds and other damp habitats where they live. To eat, they grate algae and other organic materials into tiny particles using their small teeth. Younger tadpoles have long, coiled bowels that are essential for extracting as many nutrients from algae as possible. Tadpoles fall prey to animals such as larger frogs, fish and birds.